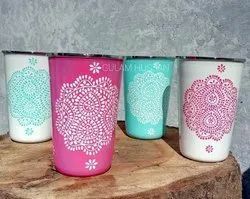 Bring nature indoors with these bright and colorful stainless steel hand-painted floral Tumblers designed by the skilled artisans of Kashmir. Available in assorted/custom designs. Aluminum Cans We are engaged in offering Aluminum Cans which are known for its effectual functioning among our valued clients. Our company offers a wide range of Composite Cans that can be printed with customized design and other information to suit the requirements of the clients. These Composite Cans are available in different designs. Industry: Food, Pharmacy, Cosmetics etc. We make PET cans for packing various dry fruits like cashews, almonds, raisins, pista, walnuts, apricots etc. PET cans are 100% Food Grade and provides airtight packing. As a noteworthy entity of this domain, we present clients with the optimum quality of Brush Can.